Cinder makes writing QuickTime movies a straightforward task via the qtime::MovieWriter class. Creating a basic QuickTime movie is easy, and qtime::MovieWriter also exposes more advanced options which allow you to take full advantage of the features of modern codecs like H.264. To setup an instance of qtime::MovieWriter, we'll need to know two things: the path where we'd like to create the movie, and its dimensions in pixels. As an example, we'll imagine we'd like to create a movie called myMovie.mov and we'd like it saved into our user documents directory. We'll also assume the movie is 640x480 pixels. The documentation for qtime::MovieWriter::Format provides a more thorough list of its options, but a key principle is that the default settings will achieve the best possible quality with one exception: multiPass encoding is not enabled by default. This is a technique which allows QuickTime to make several passes over the frames' data, and can result in much higher quality output. At the time of this writing, only the H.264 codec can make use of the technique. However this is not enabled by default because it can result in a lengthy postprocessing phase, and it requires the creation of two temporary files. The first of these files QuickTime creates for its own purposes, and the second qtime::MovieWriter makes to store temporary copies of all frames supplied by calls to addFrame(). However all of this is handled automatically when multiPass encoding is enabled via qtime::MovieWriter::Format::enableMultiPass(). 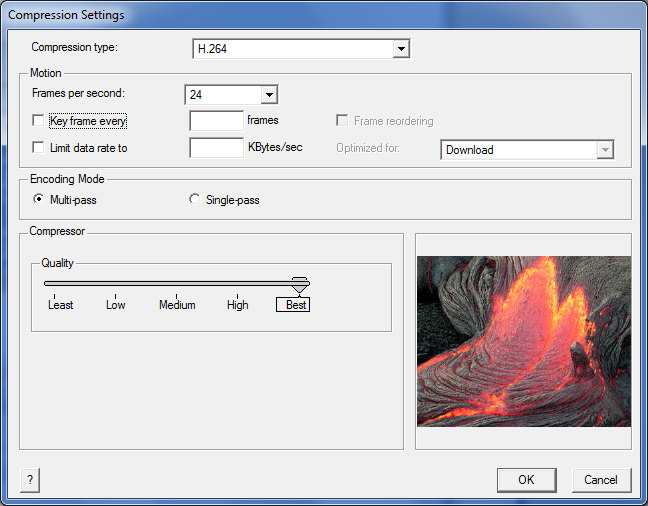 QuickTime provides a standard user interface for specifying encoding options, and Cinder makes this available via the qtime::MovieWriter::getUserCompressionSettings function. This function can be used to populate a qtime::MovieWriter::Format instance. Also note that the resulting instance may contain additional settings that qtime::MovieWriter::Format does not provide direct functions for manipulating. An optional parameter allows the specification of a preview image for the dialog. There are a couple of known issues we're still looking into in the qtime::MovieWriter class. The first is that there is a visible gamma shift (things get brighter and desaturated) with certain codecs, including H.264. This seems to be a pervasive problem with QuickTime, and one which video encoding even with Apple's own QuickTime Player suffers from. There are numerous discussions of the issue on the internet, and we have yet to find a solution, unfortunately. Also currently qtime::MovieWriter does not support audio exporting, and this will be introduced in future revisions.